My kids are full of excess energy lately and we are stuck inside while the baby naps during the day, so we came up with an indoor snowball number race activity to get us moving and learning together since they LOVE snow! 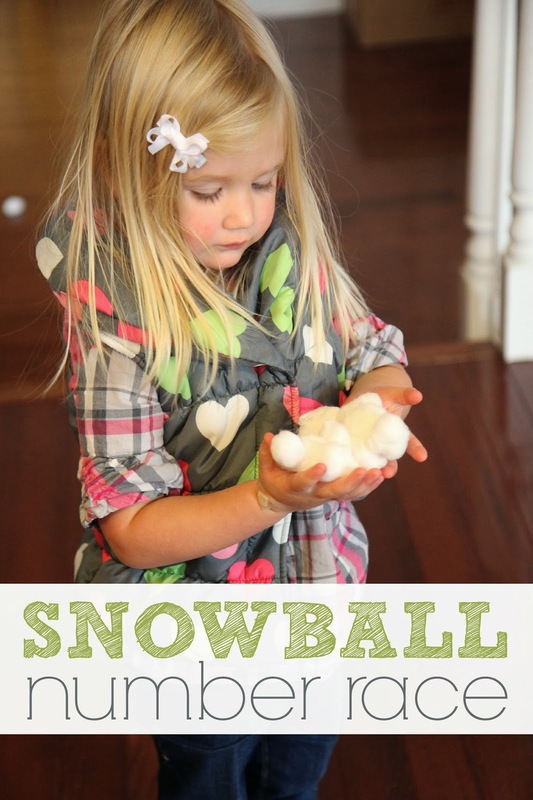 Some of you may have actual snowballs you could play this with, but since we live in warm and sunny California, we used cotton balls for this activity. To start off this activity we wrote numbers on coffee filters for my 3-year-old and simple addition sentences for my almost 6-year-old. Then we placed them all around the room. Then we spread cotton balls all over the floor. Here's a photo of one section of our "snowballs." 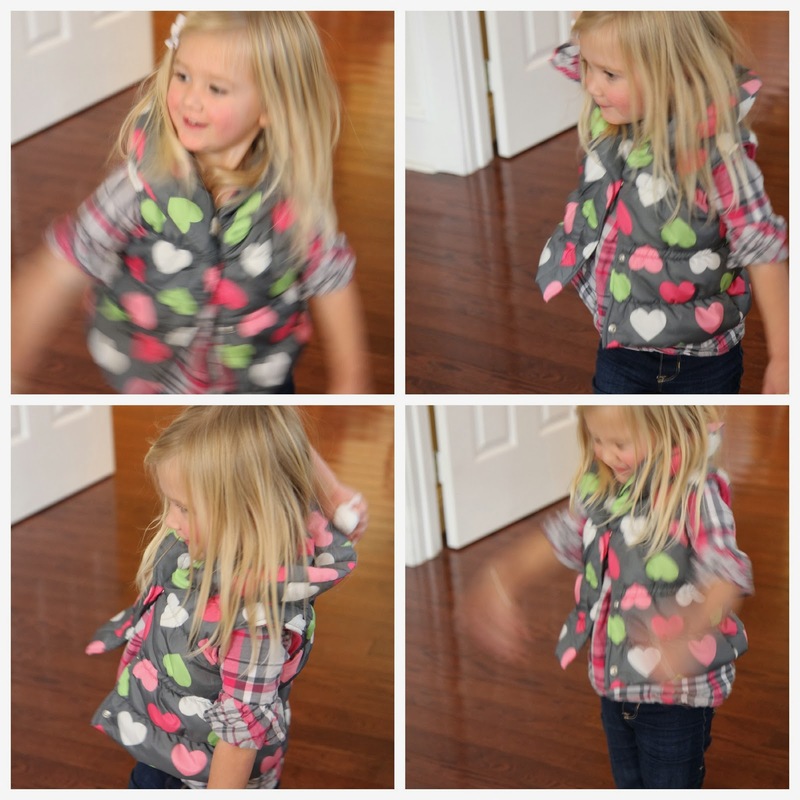 To play the game the kids ran around the room and picked a coffee filter with a number (or addition sentence on it). Once they had it they had to fill up their coffee filter with the correct number of "snowballs." After they had the right number of snowballs they got to throw them all over the room... and at each other! Then they grabbed a new numbered coffee filter, raced around (or crawled around) filling it up... and started all over again! 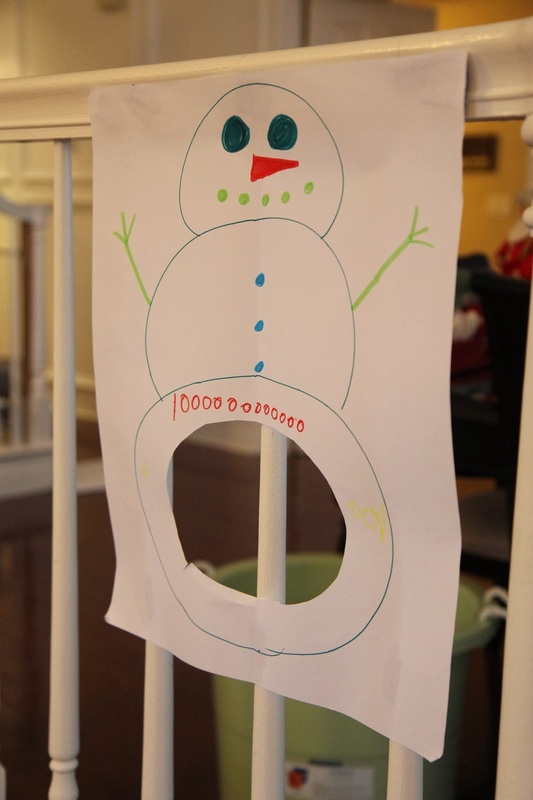 ** After a little bit we discovered that my 3-year-old didn't love getting cotton snowballs thrown at her, so we made an adaption to the activity and the kids got to throw their snowballs through the snowman once they were done collecting them. This adaptation was my 6-year-old's idea and I loved it! We moved close and further back to throw the snowballs and had a lot of fun. 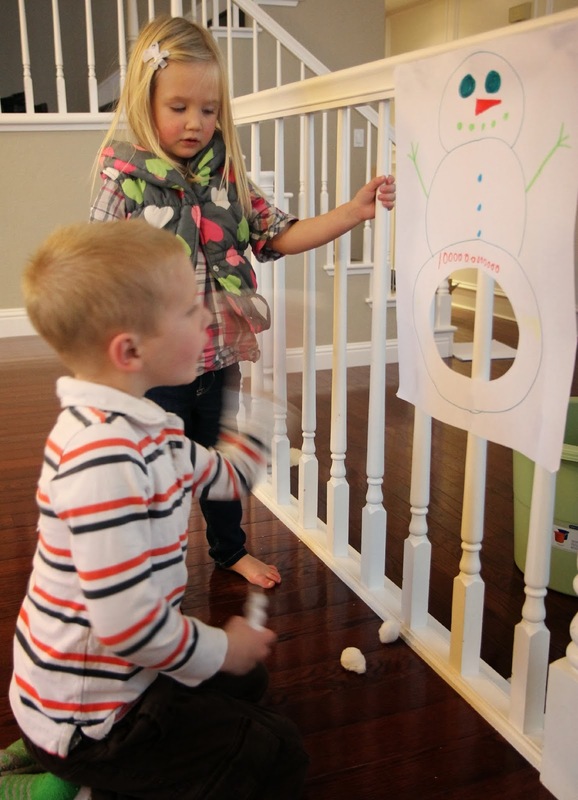 Here's a close up of our simple snowman toss game. If you want yours to last longer than a few hours, use foam board or posterboard instead of easel paper like we did. Hopefully your kids enjoy this snowball movement game as much as mine did! Two other snowman activities we love are our Build a snowman dice game and our Snowman name hunt activity.